How to buy Bitcoin using Paytm, PhonePe and Tez in India? 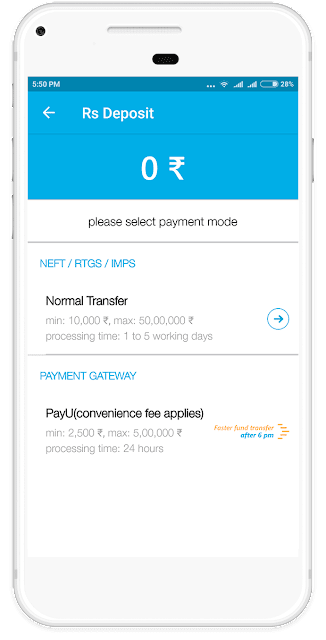 The payment and money transferring convenience Paytm bring is unmatched. No wonder it’s been downloaded over 100,000,000 times on Android devices. PhonePe, Tez, and BHIM are another money apps that have made lives easier for millions of its users. How to buy Bitcoin using PayTM, PhonePe, Tez and other such related apps? There are few platforms that facilitate the over-the-counter purchase of Bitcoin. LocalBitcoins and Paxful are possibly the most popular names. What happens is sellers list their BTC amount and the price. And buyers choose from this listing and pick whichever matches their needs. Similarly, buyers also their list their offers—what amount of BTC they are looking to buy and at what price level. The seller can go through the listing and pick whichever suits their interest. Now buyers and sellers here can agree to make the money transaction through different modes. While a few months back, direct bank transfer and PayPal was preferred, today different e-payment solutions have taken over. Needless to say, Paytm, PhonePe and Tez top that list. How to buy Bitcoin in India instantly? Go to the either LocalBitcoins or Paxful, find the right seller and make your purchase. This method of buying Bitcoin is not recommended. Making over-the-counter purchase involves a lot of risk of fraud. In fact, there have been countless instances of scams on such cryptocurrency marketplaces where the sellers list their amount but even after getting paid, buyers never receive their BTC. Only last year in September, a man from Bhopal was arrested by Police for cheating Bitcoin buyers through LocalBitcoins. The accused would contact a potential victim through Whatsapp, finalize the deal and then ask the person to deposit a sum in his bank account. Once the transaction was made, he would simply change his number without offering the promised BTC. Now note, these Peer-to-Peer platforms do take all the right measures to ensure that nobody is cheated and everything stands ethical. No wonder thousands of deals are finalized there every day. But even then there are loopholes. Meaning, if you’re not extremely careful, you can be scammed. So why take the risk?! There’s another way – safer way – to buy Bitcoin using Paytm in India. Zebpay promised its users that 2018 is going to be a big year for them. And it’s standing true to its words. In the past few weeks, it has introduced multiple new Cryptocurrencies, including Ripple, Ethereum, Bitcoin Cash and Litecoin. It has just celebrated its 3 million user base. And now, the exchange has done something even incredible. Zebpay has launched UPI deposit option. UPI or United Payment Service is an instant payment system developed by a wing of Reserve Bank of India (RBI). You can instantly transfer money between two bank accounts using a unique UPI address (like Aadhaar or your phone number) and PIN. To know more about this, please go here. Now, using this payment mode, you can easily transfer money from your bank account to Zebpay’s bank account. It will soon reflect on your Zebpay wallet. And then you can purchase your Cryptocurrencies. Not only is this deposit option super-quick, it also doesn’t include any fee. Yes, 0% transaction fee. 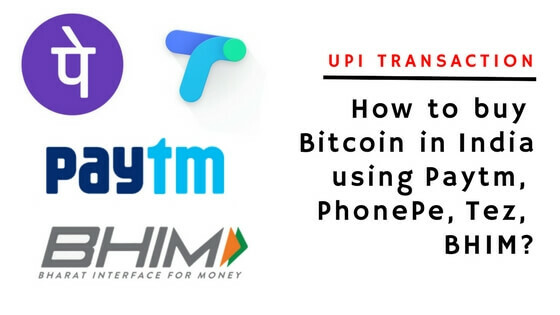 BHIM, Tez, and PhonePe are UPI based payment apps. Paytm was earlier a digital wallet. But now it supports UPI transactions as well. So now you can use any of these apps, and other similar services, to deposit money to Zebpay account using the UPI option. And doing this is extremely easy. 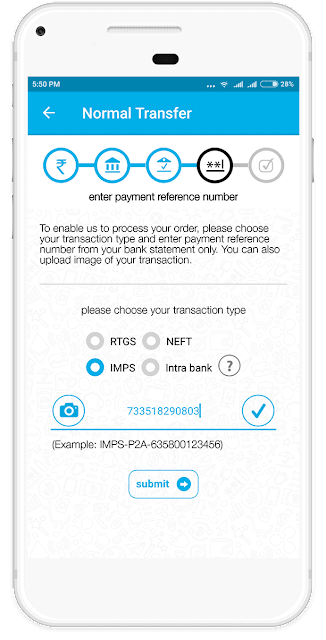 How to Deposit Money in Zebpay Using UPI Payment Option? We are going to use Paytm as an example here. 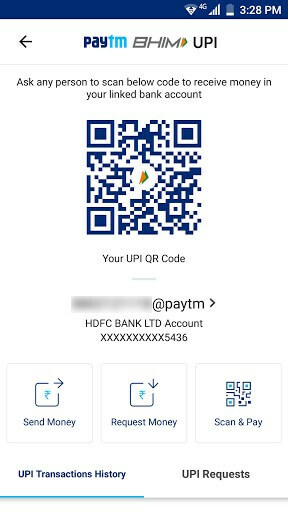 Using UPI payment option is similar on other apps. The interface is different, but the steps are same. This whole process can be divided into 2 parts. 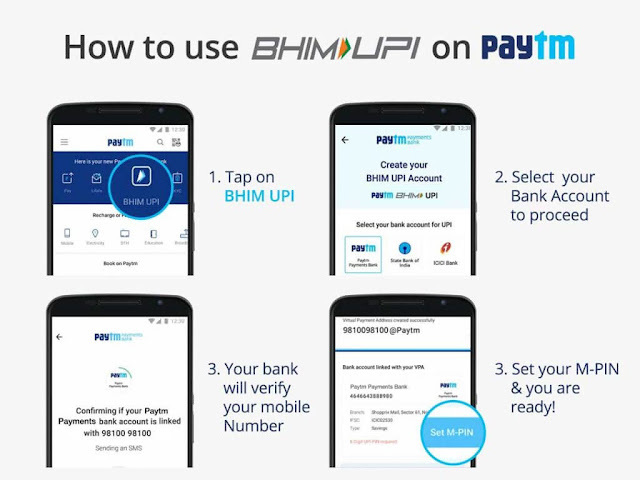 Step 1: Activate BHIM UPI in your Paytm app, if you haven’t already. Just tap on the BHIM UPI button. Select your bank name and add your bank account details. Once Paytm confirms that your mobile number matches the number that is linked to your bank account, your UPI facility will be activated. Step 3: Click on the “Send Money” option. You will be taken to a page where you would have to provide the bank account details of the person who you want to send your money to. Step 5: Click on the “Pay” option and then proceed and confirm. You will be asked to provide your pin. If everything goes well, in the next screen you will see a confirmation code that the transaction is done. You have successfully transferred the money from your bank account to Zebpay’s bank account. Step 6: (VERY IMPORTANT) Screenshot the confirmation page. And also note down the UPI reference number. First part is done. Now move to your Zebpay App. Step 7: In your Zebpay app, click on the ‘Deposit’ option. You will see two deposit options. ‘Normal Transfer’ and ‘PayU’. Click on the normal transfer. Step 8: In the next screen, enter the amount you have just deposited in Zebpay’s bank account from Paytm. Step 9: Now you will get to choose the transaction type. Choose IMPS. Then enter your UPI Transaction ID that you have noted earlier. 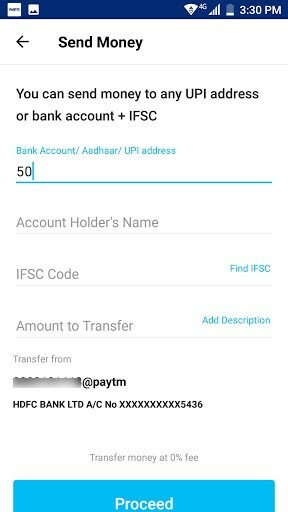 Along with that, attach the screenshot you took earlier of the confirmation from Paytm that the transaction is done successfully. Step 10: At the end, submit. Your deposit order will be processed and you will have your amount reflect on your Zebpay wallet in less than one hour (not confirmed). That’s it! 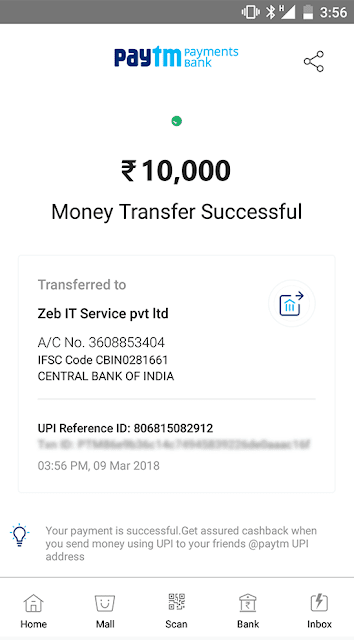 You have just successfully transferred money to your Zebpay account using the app’s UPI deposit option. 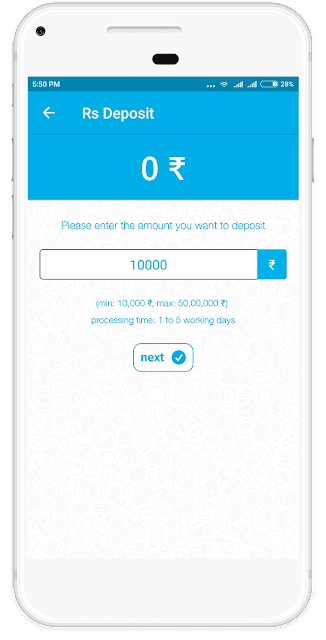 Now note: the minimum deposit through Zebpay UPI option is Rs 10,000 and maximum is Rs 50,00,000. Once your money is transferred, buy Bitcoin (or any other cryptocurrency) easily. Similar steps can be followed if you’re using PhonePe, Tez, BHIM and other related apps. Avoid making small mistakes, be careful when punching your UPI reference number. And the whole process would look convenient, cheap and quick. The Paytm and Zebpay images are taken from the website of Gadgets House and Zebpay respectively.